WoJo's Property Management in Massachusetts WoJo’s construction is the contractor you want if you need a job done right in Massachusetts. The workmanship of Dave and the rest of the WoJo’s team is an elite standard that always strives to exceed expectations. 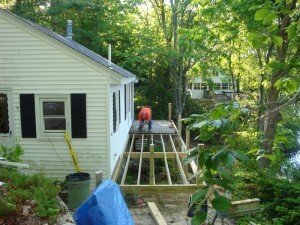 We have been doing home improvement and remodeling around Massachusetts for a very long time. If you need something done right the first time, WoJo’s is the company for you. Utilizing our proven repertoire of experience in home improvement, kitchen remodeling, finish carpentry, custom furniture, home renovations, deck building, flooring, and other handyman services, WoJo’s now specializes in property management. We are licensed for both home improvement and lead paint renovation. WoJo’s takes pride on being one of the most versatile contractors around Massachusetts. We offer the finest renovation jobs in the region, whether it’s a small project or large unit. Small Remodeling If you need a kitchen remodeled, custom balustrade railings, or seamless fitting baseboards, our carpentry is second to none in Massachusetts. We handle both kitchen design and kitchen cabinet installation. It is because of this that we’re confident in our ability to complete any job large or small around the property. Large Home Improvement Projects Over the years we have overseen many large projects as a contractor, from deck building to complete home renovations. If an old property is in desperate need of an upgrade then WoJo’s can provide all of the renovation needs. One room at a time, we’re able to transform the property from an outdated liability, to a beautiful new home. We also handle the logistical aspects of electrical wiring and other technological needs so that your system is balanced and does not overload. Updates to wiring can help ensure your home functions the way that you want it to. Custom Flooring We also specialize in custom flooring to any room in the home—from tiling the bathroom to laying a hardwood flooring in the kitchen. Our methods of precision measurements ensure that the process is done correctly the first time, regardless of tough angles. If you would like to inquire about WoJo’s as a home improvement or property management contractor, feel free to call us at 508-341-3285 or contact us via e-mail at wojosconstruction@verizon.net. We are a locally owned and operated company out of Massachusetts.